In 1969, when I was in kindergarten, my next door neighbor Alex and I dressed as Peter Pan and Tinkerbell for Halloween. I insisted on wearing a blond wig for authenticity and a white under shirt to stay warm while trick-or-treating. The result: Pure magic. "Okay, Mom. Here's the plan for Halloween. First we go to the spooky maze at Brandon's backyard. Then after that we go around the corner to Aidan's for the pizza thing, then we go to Clementine's for the snacks party, then we go to Felix's street for the taco truck. In between all those places we'll do trick or treats." "Yeah but what are we going to have for dinner that night?" "Bob, did you know Desmond saw Star Wars on Saturday?" "Yeah Felix, I said that on mistake." I believe in the power of prayer, good vibes, and mojo as healing balms. I also believe in the terrible power of disease, decay, and physical disrepair that cannot be helped though we pray with all our might. I believe we can push for our will in a situation but God’s will is what’s going to happen anyway. I believe in the power of a loving God. I do not believe that God is like Santa, rewarding the virtuous and punishing those on the naughty list. I know that sometimes terrible things happen to stellar people and that sometimes enormous good happens to those who seem to least deserve it. I don’t pretend to understand why this is true. God knows. I believe that too. I believe in the power of time. I believe that time is relative and that someone we know for an hour can change our lives as much as someone we know for a decade. I do not believe that time heals all wounds but it will at least scab them over if you allow it. I believe in the power of music and poetry as communication and communion and that reading Rumi or listening to Nina Simone is way God has of letting us peek behind the spiritual curtain. I believe in the power of mystery to shape our days and keep us interested to see what’s next. We can have a routine and believe we know what to expect but it rarely goes the way and that is a wonder and a blessing. I believe in the power of the past and the importance of learning to look back but not stare. I believe in the power of this moment. And this one. I believe in the power of each of us to bring our unique story and brand of special sauce to this life and our ability to use that power for good instead of evil. I believe you are doing the best you know how. I believe today is a good day. A funny and heartbreaking story from David Sedaris. And the Cats vs Male Model Gallery. "Mom, the field trip was just okay." "Really? I thought it was fun. What was your favorite part, the post office or the library?" "The best part was going with my friends and walking there with my friends and eating lunch with my friends and walking back with my friends." "Don't you do that everyday?" "Yeah. The days are good." "Mom, today me and Desmond and Felix got to see what the inside of an acorn looks like." "Yeah? What do they look like? 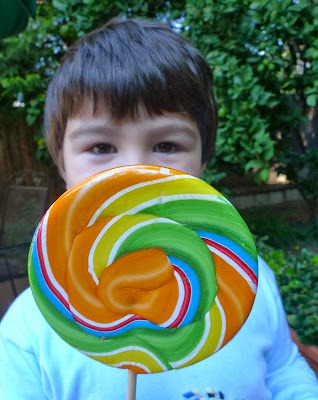 "Kind of yellow-ish and brown and harder than a gummy." "How did you guys get them open?" "Bob, what kind of burrito do you want?" "Just a melted cheese burrito." "A melted cheese burrito is just a quesadilla." "Okay, I'll have one of those too." "Felix? Do you have a home security system?" "Our main one is called T-E-D-D-Y." "Yeah, burglars don't like dealing with dogs." "I bet I could train my guinea pigs to scare away burglars too, Bob." "I think you might need a werewolf." "Hi guys. How was the park?" "Yeah, we all brought our own swords so we didn't have to share. It was a perfect day." Love this list: A map of the most famous book set in every state. If you're a long time reader, you'll know that I am somewhat preoccupied with emergency preparedness. This is a great DYI: How to put together a 72 hour emergency kit. And a compilation of cats stealing dog beds. "Did you guys have the disaster drill today too?" "Yeah, Desmond. Everybody had it, right? You had it didn't you Bob?" "I did the get under your desk thing. I knew it wasn't real though." "If it was a real earthquake we would have felt it. Right, Felix?" "The roof would have caved in or something." "That's why you hold your hands over the back of your neck when you're under your desk, Desmond." "I did that. If you don't do that your head could pop right off." "Bob, do you want some grapes?" "Are you sure? I'm having some." "No you're not, Mom. We're out of grapes." "Mom do you know that song that goes, 'Mmmm hmm mmmm hmm hmmm hmmmmm mmm?'" "And then it's 'Mmmm mmmm hmm mmm hmmm mmmm mmm hhmmmm mm?'" "Mom, come on! 'Hmmm! MMMmmmm! Hmmm! Mmmm Mmmm!'" "Yeah, I'm pretty sure it's Coldplay." "Look, Mom! The first star of the night! I'm making a wish." "Before you make your wish you're supposed to say, 'Star light, star bright, first star I see tonight. I wish I may, I wish I might, have the wish I wish tonight.'" "No. I don't think I need to that." "All right. take your chances..."
"How did that go again?" A few years back, my mom gave us a wonderful table-top haunted house. Bob has a great time setting it up every year, arranging the little jack-o-lanterns and tombstones. When we turn the switch, the lights in the window flicker and a witches cackling can be heard along with creaking and ghost-y noises. Traditionally, we set the house on the buffet in our dining room. The difference this year is that the house has to share that real estate with Bob's black beta fish, Max. On Friday we put up the house in its usual spot and moved the fish bowl over a foot or so. As we placed the skeleton in the hammock, Bob and I noticed that Max had moved over to the side of the bowl closest to the house and was watching. We stood back to see if he was just coming over to see us and we realized that Max was actually watching the haunted house. He stared, transfixed for the rest of the afternoon. We couldn't even get his attention by offering him food. He was just that into it. We shared possible explanations for Max's preoccupation. Perhaps he was waiting for someone to come out. Maybe the house looks like some underwater castle he had in his tank at the pet store. Bob suggested that maybe Max thought he was on an episode of House Hunters International. I'll admit, I've never given Max that much thought or attention. Now that he may have some inner life we can only speculate about, I think Max is pretty cool. We're already planning a little Christmas tree for him. How to be kind to an artist. A four-year-old, power, and a dinosaur costume. And a three-legged kitten wearing little hats. "The eyes make it scary." "Mom? The kids at school really don't respect old people." "What do you mean? Which old people?" "I mean really old - like the first graders that are already seven." "Mom, I've noticed that you're leaving the house a bit messy." "Yeah. This room is the thirtieth messiest room I've ever seen." "Wow. What were the other twenty-nine?" "I'm not sure but my scale's pretty accurate." So, yeah. I Googled myself. Everyone does that, right? I think? Maybe? (I really ran out of ways to waste time when I was supposed to be folding laundry.) I'm the only Lisa Page Rosenberg that showed up. The first few things I found were expected: this blog, my twitter page, a list of my old jobs on Internet Movie Database, and of course, a photo of me dressed as Princess Leia. 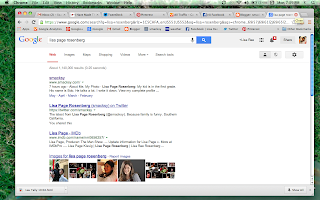 From there I fell into the sphere of The Other Lisa Rosenbergs. What had started as a quick look at my online profile became a search of other people with my name. 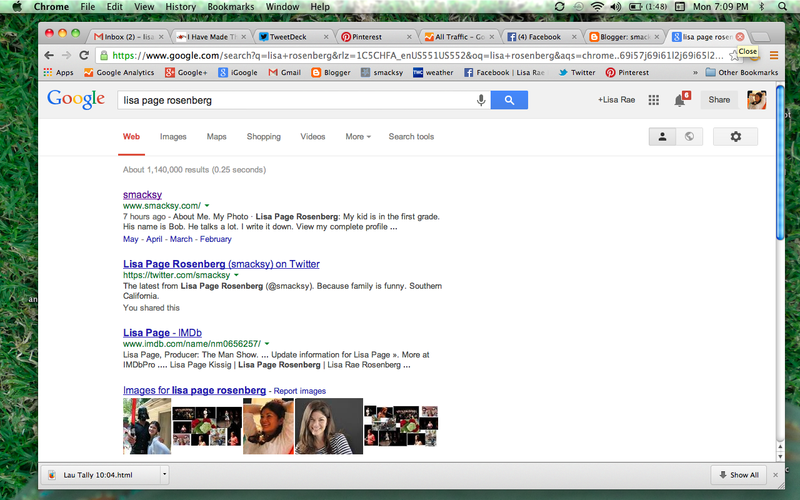 There is a world full of Lisa Rosenbergs. As I read about them I envisioned the other Lisas and their lives. A women's study professor in Ontario. A professional piccolo player in Michigan. A nursing professor in Chicago. A talk show host in New York. A former ballerina, now social worker in New Jersey. A real estate broker in St. Louis. An associate chemistry professor in Canada. An ad agency creative director in New York. An internal medicine geriatrics doctor in Nevada. An assistant principal in Milwaukee. A mathematics professor in North Carolina. Lisa's Paint and Body Shop in Rosenberg Texas. Who do you meet when you Google you? "So, Mom? While you were gone, me and Dad played some tennis over at the court at the middle school." "He taught you how to play today?" "Yeah, he did some serves." "And then we did some ballies." "I think you mean 'volleys.'" "Come on, Mom. It's ballies, cause we're playing with a ball and everything." Terrible real estate agent photos. Brilliant. And sweet baby goats playing and having fun. "Mom, I don't get it. After Ringo got a shot, he said it felt like a 'relaxing spa.' Mine sort of hurt a lot." "Do you think he might have been joking?" "He was for real and serious. Maybe it's because we have different doctors." 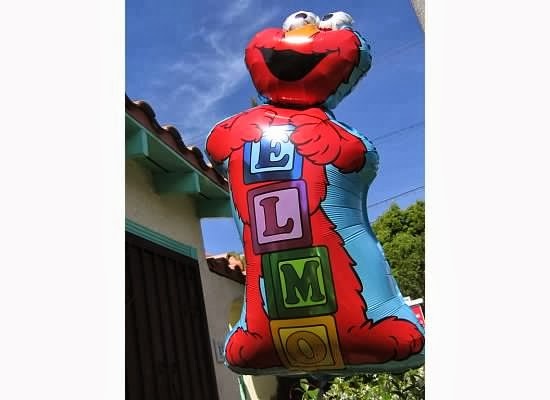 "Mom, you know what my new biggest nightmare is?" "Sydney, from Mrs. Woo's class." "Now she's the one chasing me everywhere and I have to hide from her in the worst place." "The boy's bathroom. I guess it's not as bad as the girl's bathroom, but still."